This page notes details of Cobra Jar (EARTH/Reptile/Effect Monster) : decks, tips, effect and rulings. Learn and enjoy playing Yu-Gi-Oh! Duel Links! The effect that special summons a token will help you to summon a high level monster since "Poisonous Snake Token" can be a tribute. A Reptile-type monster token is very unique. Both this card and the token has low stats. 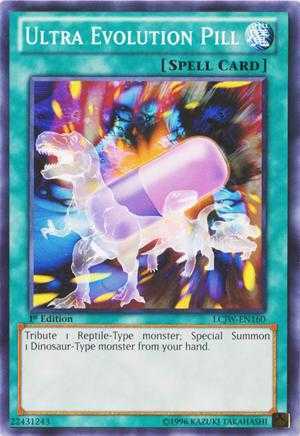 Ultra Evolution Pill can be used with Cobra Jar to special summon a high-leveled dinosaur-type monster from your hand. Also works well with a vanilla burn deck. How many copies of this card do we have in the game? Bosta é o seu rabo, digo a sua cabeça... Ah dá no mesmo. Is the token effect cannot be negated by ancient gear beast effect? Me no speak England language good, ok that? if i have "deleted" it, can i get other? When can we get more?